FILE - A soldier waves a Turkish flag as Turkish troops secure Bursayah Hill, which separates the Kurdish-held enclave of Afrin from the Turkey-controlled town of Azaz, Syria, Jan. 28, 2018. Turkey is pushing back against international calls for it to abide by a U.N.-backed cease-fire in Syria. The U.N. call for a truce comes as Ankara continues to escalate its offensive in the Syrian enclave of Afrin against the YPG Kurdish militia. “Baseless,” Turkish Foreign Ministry spokesman Hamdi Aksoy called comments by U.S. State Department spokesperson Heather Nauert, who said that the U.N. cease-fire applies to Turkish forces. “Turkey is more than welcome to go back and read the exact text of this U.N. Security Council resolution, and (I) would suggest that they do so,” Nauert said Tuesday. “We urge the U.S. to focus on stopping the regime from attacking innocent civilians instead of making statements that help terrorists,” the Turkish Foreign Ministry shot back in a statement. Equally strong language was aimed at Paris, with Ankara rejecting a French Foreign Ministry statement that President Emmanuel Macron had also called for Turkey to observe the U.N. cease-fire during a call to Turkey's president, Recep Tayyip Erdogan. “It’s not just Paris and Washington. Russia has made a statement on this (abiding by the U.N. cease-fire). Iran could jump in. Ankara has found itself alone and they didn’t see this coming,” claims political columnist Semih Idiz, of the Al Monitor website. “But Ankara will continue the [military] operation because it's too far gone to declare a cease-fire. Because they (Ankara) also fear if they stop for 30 days, they may find it diplomatically difficult to restart. This operation is too important for Ankara. They believe they are facing an existential threat,” Idiz added. Turkish-led forces in Operation Olive Branch are targeting the YPG Kurdish militia, which Turkey accuses of being linked to a decades-long Kurdish insurgency inside Turkey. The YPG is a key ally of Washington in its war against Islamic State. Despite international calls for a cease-fire and de-escalation in fighting in Syria, Erdogan announced a ratcheting up of the offensive, claiming it was about to enter a new phase. “Let everyone be ready for conscription, though the need is not immediate. We are just before a new resurrection,” said Erdogan at a rally. Ankara has announced the sending of special forces drawn from both the paramilitary police and army to Syria. Their deployment is part of preparations for an eventual assault on Afrin’s main city, also called Afrin. Turkish forces have experience in urban warfare, having spent months removing insurgents from towns and cities across Turkey’s predominantly Kurdish southeast two years ago. The fighting claimed many civilian lives and caused major destruction and displacement of an estimated half-million people. Turkish ministers claim the experience gained from the fighting means its forces are well prepared for any assault in Afrin. But urban operations inside Turkey were mainly against largely poorly trained and armed fighters, many of whom were teenagers. Analysts warn any assault on Afrin, home to several hundred thousand people, is likely to be a very different proposition. “There will be significant defensive preparations. Of course Turkish special forces have some experience, but they will be facing very battle-hardened fighters, armed and backed by at least one superpower or possibly two superpowers,” Idiz pointed out. FILE - Fighters from the Kurdish People's Protection Units (YPG) monitor troop movements in the area of Afrin, along Syria's northern border with Turkey, on June 9, 2017. "Turkey will face a very messy situation,” Idiz warned. “It will have street-to-street war. It's a very dangerous situation, with the risk of high casualties and the risk of collateral damage. This will carry the conflict to a new level. Obviously, the international community will weigh in,” added Idiz. Observers suggest the Turkish military buildup could be a ploy to force the YPG Kurdish militia to quit Afrin. 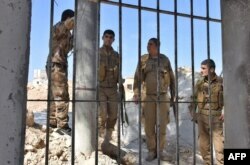 But an expert on Kurdish affairs, speaking anonymously, warned the militia will likely fight to the end, due to the city’s important symbolism to the Kurdish movement. “It will be their Stalingrad,” the expert said, referring to the bitter World War II battle between Russian and German forces in which over 1 million people died. The Turkish president, too, is drawing on history, equating the current Syrian operation to Turkey’s independence war. Analysts suggest Erdogan will likely remain impervious to international pressure, especially with general and presidential elections due within 18 months.